So what are the ‘outrageous remarks’? It appeared that Scruton had said that Islamophobia is ‘a propaganda word invented by the Muslim Brotherhood in order to stop discussion of a major issue’. Which is true. He also said that ‘Anybody who doesn’t think that there’s a Soros empire in Hungary has not observed the facts.’ A fact which is also true. Obviously since the British Labour party became a party of anti-Semites it has become exceptionally important to pretend that anti-Semitism is equally prevalent on the political right in Britain and that to criticize any of the actions of George Soros is in fact simply to indulge in anti-Semitism equivalent to that rolling through the Labour party. A very useful play for the political left, but wholly untrue. Anyway, I say ‘it appears’ that Scruton said this because there seem to be a few journalistic problems here. Though Eaton says that Scruton said the above I am not confident that this is so. 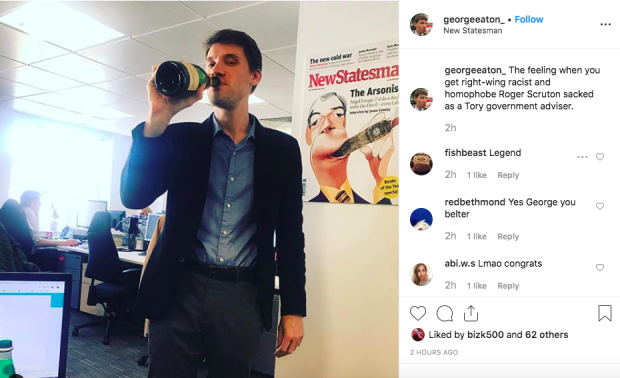 For Eaton – who used to be the Statesman’s political editor – appears to have a somewhat Johann Hari-esque way with quotes. He claims, for instance, that what Scruton said about Soros was in actual fact a quote ‘On Hungarian Jews’. As though Scruton had attacked all Hungarian Jews, rather than one very influential and political man who happens to be a Hungarian Jew. Which is something very different. Where Eaton claims that his interviewee was talking about all the Chinese people, the quote (which he decided to edit so that it fit his print edition, or his sloppy journalistic narrative) is something that is at the very least contestable and strikes me as rather obviously true. Anyhow, this journalistic dishonesty has had its desired effect. Within four hours of Eaton tweeting out his misquotations of Britain’s most prominent living philosopher, the housing minister (James Brokenshire) announced that Scruton had been dismissed with immediate effect from his role as Chairman of the ‘Building Better Building Beautiful Commission’. The sacking from this unpaid, advisory position came because of these ‘unacceptable comments’. The Statesman itself has decided to glory in Scruton’s sacking, and in the process ramp up even further its claims of what happened in the interview. So criticism of the Chinese Communist party is criticism of ‘Chinese people’ and criticism of the Muslim Brotherhood is in fact comments about ‘Muslims’? I wonder whether these editorial standards are acceptable in the Statesman these days? Perhaps they are. Perhaps people can edit quotes, misrepresent quotes, and then hand over to colleagues to sensationalize these claims and this is all fine. It isn’t my parish. It isn’t my business. What does strike me as my business – and the business of other more conservative (and Conservative) voters is the despicable behavior of James Brokenshire and the Conservative government in all this. Readers may remember that when Scruton was appointed to this role some months ago there was a certain amount of push-back from the Labour benches. Back then somebody called Andrew Gwynne, of the Labour front-bench, even declared that, ‘Nobody holding [Scruton’s] views has a place in modern democracy.’ Meaning that in future anybody wishing to learn about Kant, Hegel or Spinoza will have to go to mine the brain of Andrew Gwynne for assistance. But I was struck then – as I am struck even more now – by the sheer stupidity and cowardliness of this Tory government. After the Labour party’s attacks on Scruton several Conservative friends told me how much they admired Brokenshire for ‘standing strong’ on the matter of Scruton’s appointment. As though defending the appointment of Britain’s most famous living philosopher to an unpaid, minor advisory role was the modern equivalent of standing strong after the invasion of Norway. I said then, and I say again now, that almost everything that is rotten and despicable in the modern Conservative party can be seen in this attitude. We have now had nine years of Conservative-majority government in the UK and the appointment of Scruton to an unpaid quango position was just about the only identifiable conservative appointment onto a public body that this government has managed in all this time. By contrast, when Labour were last in power they spent their time positively stuffing every public appointment with their own kind. There are many reasons to feel contempt for the modern Conservative party. Personally I can see no reason, after the fiasco they have made of Brexit, to ever vote for them again. But now this? After nine years we have little ministers like Brokenshire sacking people on the strength of partial misquotations on Twitter? Well to hell with them then. A matter that Sir Roger may like to pick up with me (among other things) when we get together for our Spectator live event in London in a few weeks time.